It looks like the M Division is going to war against the Porsche 718 Cayman with guns blazing. The saga of BMW’s special edition M2 is one that’s just beginning. If the high-po version of the M2 is anywhere near as good as it’s expected it to be, it’s story may not end until long after the final model has rolled off the assembly line. For now, we’re grabbing at every smidgen of information available for clues, and a rogue Bimmerpost member who’s somehow managed to snag the VIN numbers of BMW’s test vehicles may have uncovered the news we’ve wanted to hear the most. That would be in regards to the engine slated to be stuffed into M2 CS (or, if a recent Road and Track report is correct, the M2 CSL). Running the VIN numbers through a public BMW VIN decoder reveals that the F87 chassis will feature a 3.0-liter inline-six S55 engine making about 405 horsepower. Also able to be derived from the given set of VIN numbers are the transmission options, which will include a six-speed manual gearbox, because why wouldn’t BMW offer a manual in what’s sure to be the best M car to date? For those that can't row their own gears or are too obsessed with lap times to care, a seven-speed M double clutch transmission will also be on the options list. One Bimmerpost moderator went ahead and downloaded the build sheets for a couple of the coupes using the VIN numbers. 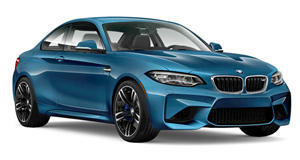 In doing so, we get to learn about a few of the M2 CS’ other enticing amenities, which include an interior trim finished in high gloss black with chrome trim finishers, M Sport Brakes, a Park Distance Control, M Sport Seats, and an M Driver’s Package all available as standard or for a premium. M2 owners who want to buy a matching M2 CS will be happy to learn that the more spritely of the baby M cars will have almost all the base M2 options available to order. More curious to us is the fact that the M2 CS comes with no retractable armrest, a weight saving measure we previously saw on the M4 GTS. To us, this means that BMW is taking extreme measures to cut weight, giving that 405 horsepower engine less mass to lug around when accelerating out of the corners. What remains to be seen is what BMW means by stuffing “M Sport Brakes” behind the 19-inch alloys. The M2 already has large rotors up front, so the M Division could either be increasing the size of the rotors or using carbon ceramic brakes instead. When it’s all said, done, and built, it sure looks like the M2 CS will be the king of its domain, laying tires and Porsche 718 Caymans to waste one lap at a time. Until time spills its secrets, we’ll have to rely on these crafty M2 CS for more leaks. Keep em’ coming.